CounterPulse is building a movement of risk-taking art that shatters assumptions and builds community. We provide space and resources for emerging artists and cultural innovators, serving as an incubator for the creation of socially relevant, community-based art and culture. 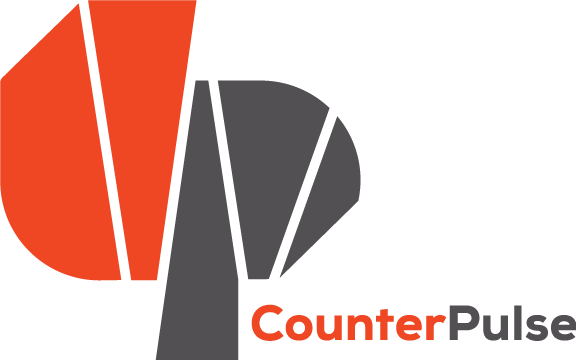 CounterPulse acts as a catalyst for art and action; creating a forum for the open exchange of art and ideas, sparking transformation in our communities and our society. We work towards a world that celebrates diversity of race, class, cultural heritage, artistic expression, ability, gender identity & sexual orientation. We strive to create an environment that is physically and economically accessible to everyone. CounterPulse is one of San Francisco’s leading small venues for cutting-edge, interdisciplinary performance. Our studio theater hosts over 300 public events each year, ranging from dance, theater and music performances to political discussions and film screenings. Joining the CounterPulse team means joining a group of incredibly smart and dedicated folks who are driving a growing and changing organization. Our culture is artist-focused and highly collaborative. As a new staff member, you will have the chance to participate in meaningful conversations about the future of our organization, the impact we can have in our community, and the role of art in society. You will participate in selecting artists and envisioning our programming. We value the flexibility and perks of working at a small organization, and we think you will too. CounterPulse fosters a creative and professional environment that reflects the diversity of San Francisco. We actively recruit a wide pool of applicants representing dimensions of difference that include—but are not limited to—age, national origin, ethnicity, race, religion, ability, sexual orientation, gender or political affiliation. As the CounterPulse Development Director you leverage the story of CounterPulse to the funding community. You advance the development and fundraising goals that support the mission of the organization. You’re the mastermind behind CounterPulse’s grants strategies, special event, capital campaign, and development strategies. By ensuring that CounterPulse succeeds you help make the world a more hospitable place for arts and culture. As a Theater Technician you oversee the operation of our theater and technical equipment for productions at CounterPulse. You make the show go on! By working directly with our artists and producing staff, you bring productions to life at CounterPulse. Applications accepted ongoing for Spring 2019 season.